The huge green eyes are fixed and unblinking, with a challenging stare. Neat nostrils are quivering with barely restrained emotion. Rosebud lips are pursed with determination. You’ll have seen this face on TV, when actress Jenny Seagrove breathes life into the character of barrister Jo Mills, who unflinchingly battles various contentious issues like MRM vaccinations, mobile phone masts and vivisection, as she gives voice to the victim and speaks up for the defenceless. 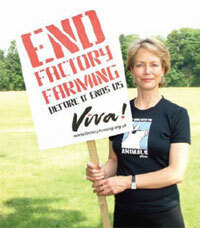 She’s patron of the Bristol-based vegetarian and animal welfare group Viva!, a patron of the British animal abuse organisation Welfare Aid, a trustee of the Born Free Foundation and an avid supporter of the anti-vivisection society PETA, and Recycle Now. Whether it’s supporting animal welfare or environmental issues – or her footie team Everton FC, of which her theatre impresario partner Bill Kenwright is chairman – this is a woman of substantial passion. So much so that I felt compelled to make a confession…. I deplore laboratory experimentation on animals, it makes me feel sad and helpless, I tell her. But every time one of those anti-vivisection leaflets plops through my letterbox, I know the pictures will be so heartbreaking that if I see them I’ll end up in tears. So I don’t look. “I’m with you!” she almost gasps. “Sometimes you just think ‘I can’t! I don’t want that in my head.’ It’s very difficult. I know what’s going on, an animal dies in an EU lab every three seconds, and sometimes I think I just can’t know more, it hurts too much. I’ll just send my money or do what I can in terms of raising awareness. She’s an inspirational idealist, but she’s also an emotional softie. She got the science A Levels to become a vet, but realised she couldn’t cope with the harsh realities of the job. Instead she notched up a further three arty A-levels and enrolled at Bristol Old Vic Theatre School. It was a particularly good crop during her three-year stay: her contemporaries included Miranda Richardson, Greta Scacchi, Daniel Day-Lewis and Amanda Redman. Her Judge John Deed co-star, fellow vegetarian, environmentalist and animal rights campaigner Martin Shaw, is not just a dear friend, but also shares her passionate views. To her delight the chemistry they created on the small screen is now refuelled in a new stage partnership, in The Country Girl, about a washed-up actor and his long-suffering wife whose marriage is put to the test when he gets a second chance at stardom, which comes to Bath Theatre Royal in September as part of a national tour, before moving to the Apollo Theatre in London until February. And is Jenny, with all her green credentials and eco-campaigning, a country girl? “I’m a townie by necessity who is a country girl at heart – but real country people are much less sentimental than I am about the environment and animals,” she admits. The list goes on and I start to get breathless. So what’s her favourite green tip? “Bokashi juice!” she cries. “You put all your compost stuff into the little Bokashi bin, add some bran, and after a few weeks you get this weird juice out of it which is packed with microorganisms. It makes the most incredible drain-cleaner. Jenny Seagrove appears in The Country Girl at Bath Theatre Royal 20-25 September and the Apollo Theatre, London, 11 October- 26 February.